The Porsche 911 range seems to grow each month and now comprises of no less than 23 unique offerings, five of those are Carrera GTS models and the focus of this review, the Carrera 4 GTS coupe may well be the pick of the bunch. 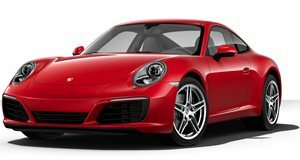 Featuring some desirable standard equipment and an appreciable power hike over the standard Carrera models, the GTS variants can be a well-balance middle-ground without resorting to the manic performance and price levels of the full-blown Turbo models. The cabin of the GTS is broadly similar to the rest of the Carrera range, the fit and finish is exemplary and even without delving into the expansive customization list, the materials on the base interior are top class. Controls and switchgear feel very solid and the front seats are supremely comfortable on longer trips. Your friends in the back won’t be as pleased though as getting in and out requires some acrobatics and the restricted leg and head room makes the rear row best suited to children and shopping bags. The front trunk is deep if not exactly very wide but a surprising number of soft bags can be squeezed into it. The Carrera 4 GTS feels much like a slightly sharper Carrera 4 S on the road because in essence that is what it is. Standard 20-inch wheels, lowered PASM sport suspension and a sport exhaust combine to give the GTS an edge in grip and handling levels, elevating the already accomplished cornering abilities. Braking is very impressive too and that rear-engined traction out of corners allows you to slingshot out of bends at silly speeds. The ride quality does not suffer much from these changes and the GTS remains a smooth and refined cruiser, the large tires do transmit some road noise into the cabin but overall it is perfect for long highway trips. Aside from the top Turbo variants, the Carrera 4 GTS is the quickest accelerating car in the ‘standard’ 911 lineup. Power comes from a 3.0-liter twin-turbocharged flat-6 engine which produces 450 horsepower and 405 lb-ft of torque. This model is all-wheel drive and either a 7-speed manual or 7-speed dual-clutch PDK transmission is available. The PDK transmission offers the best results with a searing 0-60 mph time of 3.4-seconds, the manual car posts a time of 3.8-seconds. The PDK transmission is not quite as smooth as more conventional automatic shifters at crawling speeds but it offers near-instantaneous shifts and if you want to go old-school the manual transmission is great too. Few rivals offer this level of performance and the addition of all-wheel drive makes for superb wet-weather grip too. Consumption figures of 20 mpg in city driving (18mpg with the manual) and 26 mpg on the highway run are commendable for this level of performance. It is worth noting that the Carrera 4 GTS is essentially a well-optioned Carrera 4S and you can add basically all the GTS features to it if you wish. Tick the PASM sport suspension option, Sport Chrono Pack, sports exhaust, sport design bumper, sport seats and the Carrera S Powerkit and your Carrera 4S is now a 4 GTS. Going this route does actually cost you more and you will miss out on the center-locking Turbo S style 20-inch alloy wheels, embroidered headrests and various decals that are unique to the GTS. The rest of the standard features on the 4 GTS mirror those of the 4 S and include 4-way power front sport seats, park assist front and rear, touchscreen infotainment system with integrated Bluetooth and smartphone connectivity as well as an 11GB hard drive music storage system. Performance related items include uprated brakes, rear-wheel steering, a limited-slip rear differential and active stabilizer bars. Premium Packages add a number of additional luxury items such as LED headlights, auto-dimming mirrors, 18-way power adaptive sport seats, front seat heating and ventilation, keyless entry and ambient LED lighting. Standalone options include a front axle lift system, ceramic composite brakes and interior trims in Alcantara, leather, carbon fiber and Aluminum finishes. The vast Porsche 911 range offers a bewildering array of models, the well-chosen specifications of the Carrera 4 GTS coupe may well make it the sweet spot in the range though. The additional power and subtly different looks over the base models allied with a comfortable suspension setup offer the best of both worlds, especially if you intend to use your car regularly. Performance and specification levels are still class-leading and the range of customizations make this 911 a must-try for any shopper considering a two-door sports coupe.